Having grown up in Paris and Vietnam, Nicky travelled extensively, and the inspiration gathered from all corners of the globe directed her to study interior design, After graduating she set up Nicky Dobree Interior Design specialising in luxury ski chalets villas and contemporary residential interiors. Nicky’s reputation has continued to grow over the last 10 years which has established her as an international designer with clients across Europe. 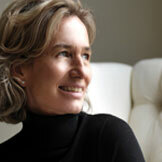 Nicky has been extensively published, and is amongst the top 100 House & Garden Magazine leading designers.